Pretty exciting, isn't it? I count 8 or 9 seedlings of a plant that intrigues me so much, I collected its ripe seed and sowed it last fall. Outdoor fall sowing works for many temperate-zone plants, which expect* a cold-then-warm cycle to cue them that conditions are favorable for embarking on life as a plant. Some plants (probably those whose seed ripens in summer) expect a warm-cold-warm cycle. Of course, you could buy a special fridge for your seed-sowing projects to recreate these cycles artificially; your apple emits ethylene gas that can inhibit seed germination. After all, you'd be a silly apple seed to germinate and then get eaten by a passing mammal - you'd never survive the digestive-tract journey! A seed is very much alive - but in a far less vulnerable form than a just-sprung seedling. LABEL. 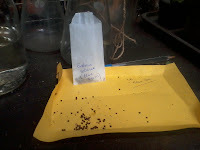 Label whatever envelope or slip of paper you use to collect seed; label pots or trays you sow seed in (sticks work; you can write directly on some pots, or on tape). Same goes for cuttings, of course - but today's about seeds and seedlings. Here's some seed of Salvia sclarea, a beautiful blue form - as you can tell, from the labels - on the paper I'm using to clean it, and on the envelope storing the cleaned seed.. I collected this seed at the Gowanus Nursery, for Michele. (You may thank her for this important propagation lesson. Let's repeat it together: LABEL.) You can see that some of the seeds are dark brown, some creamy, and some intermediate in color. The darkest ones are ripe for sure; the palest likely not to be. Some in-betweens might be developed enough to germinate. If you've been putting off growing perennial plants from seed - fear not. Many are remarkably easy. Sow seed in fall - or whenever it's ripe - and let nature take its course. And label, so you'll know in spring what you've grown! *It's usually said that these species "require" these cold/warm cycles. That is, of course, because they evolved where those cycles occur; I say "expect" because I'm trying to take a step back and inhabit a larger context (along with the plants). I could have mimicked this process to trick them into "breaking" dormancy and germinating on my schedule. But no need - the weather and I and the seeds are all pretty much on the same page. So they made a break for it when the time was right. Labeling might officially be the hardest part. That's funny... it's also one of the parts I have to do without help from the actual plants (or plants-to-be)!